Christmas day was ‘magical’! I missed my first-born badly, but we spoke with one another twice; once right after midnight Mass and the other time on our Canadian Christmas morning. The day was all about family and friends and feasting; the emphasis for this year. The smells of freshly baked mincemeat tarts filled the house early in the morning…followed by apple-cinnamon festive carrots…..stewing cranberries and a golden brown turkey! It was marvelous! Beautiful red wine and a lovely feast day….sharing in the good news of an infant boy who came to give a message of peace and hope to an aching world. This afternoon, I have Him in my heart as I think of grieving that continues for countless ‘others’ who rebuild after last year’s tsunami. Nineteen years ago, at 12:08 on Christmas Eve, my willowy dancer was tugged into life! And right at the anniversary of her birth on the 24th this year, I was dancing in her arms…mother and daughter wrapped up in oneanother. 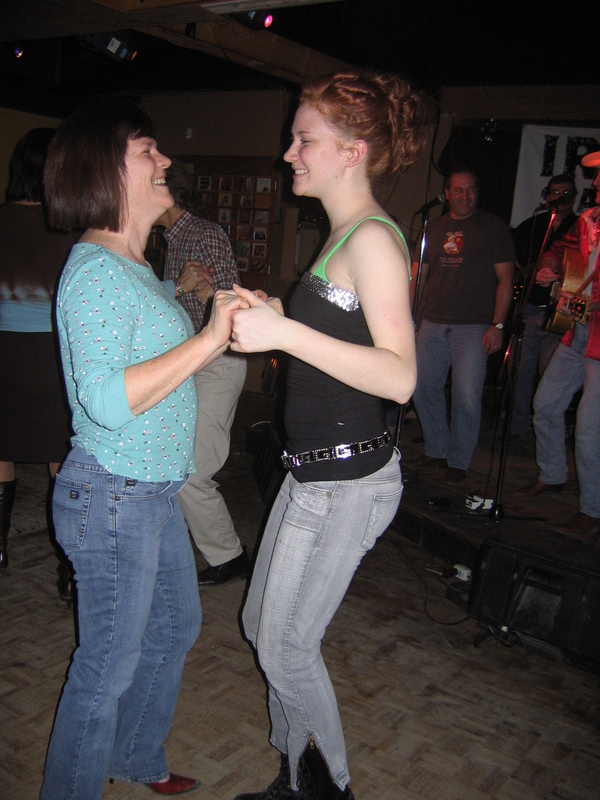 It is interesting that she chose my favourite honky-tonk spot to celebrate with her friends…it is cozy and family-like and everyone in the place shared lemon meringue pie with us….not often one has Tom Phillips singing your Happy Birthday to you as you stand proud on a dance floor! A ‘magical’ event! In the spirit of Andy Warhol, I dreamed up a food-drive with a ‘twist’ this year! 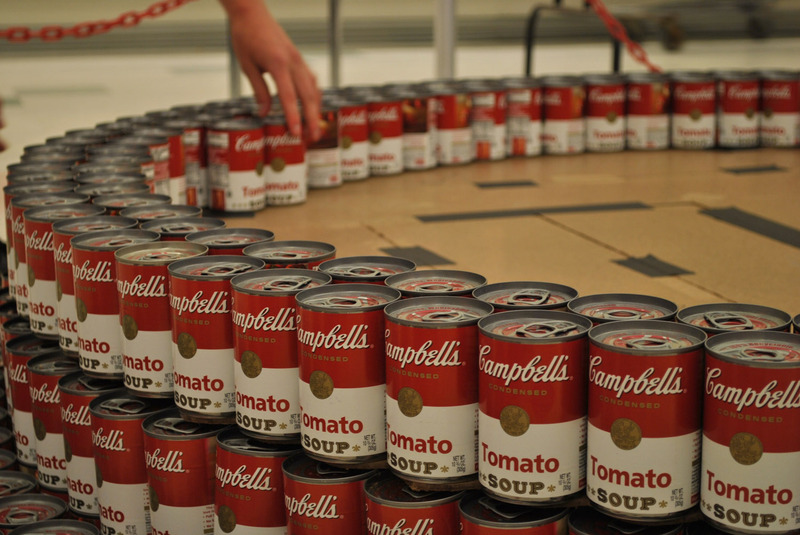 Our students collected 1, 599 cans of Campbell’s Soup and constructed a Christmas Tree (A Souper Tree!) that ended up 6′ 7″ tall. Afterall, Andy had produced a Souper Dress! Why not? We had already sent a massive collection for Christmas food hampers to the St.Vincent de Paul Society. This was a secondary collection that would help to replenish stocks in January when sometimes people are suffering the residual depletion of basic necessities. There was a sense of competition and delight as our community came together and built and re-built, learning about repeating motifs, sound structures and multiplication! Wow! I wish that I could publish the face of each and every child who gave something to the world through this project! Awesome! Another Christmas Miracle! By the way….I give all the credit for my innate sense of ‘giving’ to my parents who have been giving blindly for years and years! I love you Mom and Dad! Some people travel long distances to see beautiful places…I travel inside my head mostly. 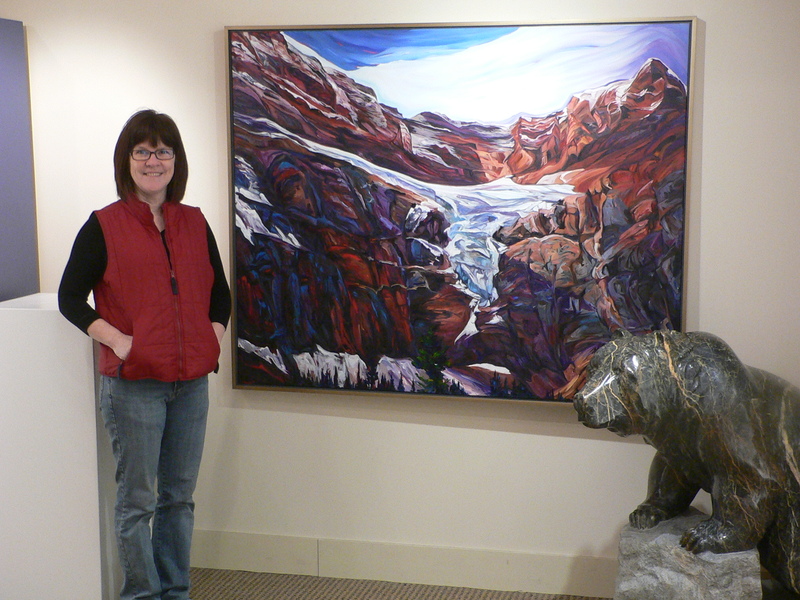 I’ve been very challenged the past three months with a painting…just some issues of composition that kept annoying me. I couldn’t even close my eyes at night, without seeing it…trying to resolve it. Well, tonight I sipped some lemon-flavoured water, turned on an old Joni Mitchell cd, talked to my daughter briefly about the troubling place on the canvas….and went forward with courage! I’ve traveled to and from this glacier a thousand times this past three months…and now I can put her to rest. I’m celebrating and ready to go on with my Christmas time in the studio! Time to plug in some coloured lights out there! Take a look at ‘her’ in my most recent photo album! Welcome to my world! We move toward the lighting of the final Advent candle and I reflect on the spiritual journey I’ve made this year. I am astounded by God’s love for us and that I have such blessings in my life! In a world where so many strong individuals confront devastation…whether that be through a battle to recover from a hurricane…to fight the result of an AIDS Pandemic…or to struggle, along with family members, when one of the family is in the midst of suffering stroke or cancer or the pain of arthritis…in THIS world, I presently enjoy health, peace, love and well-being. As I repeat again and again to my students…spirituality (as opposed to religious practice) is to live out the concept of ‘faith in action’, always giving Glory to God who created us. I ask God to use me as an instrument…to give and be DIVINE magic in the world. Through shared DIVINITY, this Advent has given me a sense of being rooted in a huge tree! Although there is no evidence in terms of my finances or my position in the world, I am one of a ROYAL lineage. To those who plunk themselves down on this blog….if even for a ‘passing through sort of experience’, please know that you are special and that this little lady wishes you a joyful and comfortable Christmas season. I’m hoping that you have someone to love…for it is in loving, that you will enjoy the sense of also being loveable. 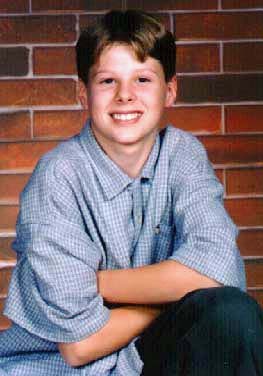 Jarrett Alley sat in my Grade Five classroom and later, my Grade Seven classroom. This was a young man who had tremendous energy. He took every project on with tremendous enthusiasm and prided himself in going the extra mile on everything. Today marks the anniversary of his passing from this life in 1997, leaving behind his Mom, Dad and younger sister…and his move into the next life, where he very much sits in a corner of my heart…influencing how I think about and how I treat others. Jarrett is responsible in part, for the way I view my life. I believe deeply that there is a bliss in knowing that for today… I must celebrate being ‘fully ALIVE’! Don’t be complacent! Live each day as a fully conscious decision to find magic and create magic for yourself and others. Absolutely cherish the ‘life’ in one another and find the joy in simple things and times shared! I am so proud to have been one of Jarrett’s teachers and today I send out such love to the universe for all sons….and their families. I wish for broken families to find healing and love. On November 30, 2005 I received my brown belt!! I absolutely can’t believe how wonderful this feels! It will take years before I will be able to test for black and develop the sort of focus, discipline and knowledge required, but the thought that I have exceeded my goals in karate warms the very heart of my soul!